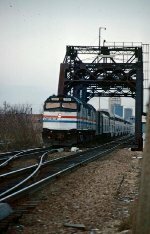 Description: A friendly wave from the back porch of Amtrak F40PHR 287 at 18th Street in Chicago, Illinois on an unknown day in May 1979, Kodachrome by Chuck Zeiler. Description: Eastbound train #356 "The Wolverine" enters Ann Arbor. The tracks on the left were the interchange with the Ann Arbor Railroad. Description: Amtrak train #356 "Wolverine" heads into the curve east of the station. Description: Amtrak 287 leads eastbound train #356 "The Wolverine"
Description: #8 heads across the KK Bridge as it leaves Milwaukee. Description: Amtrak 8 meets Amtrak 335 at KK Bridge.